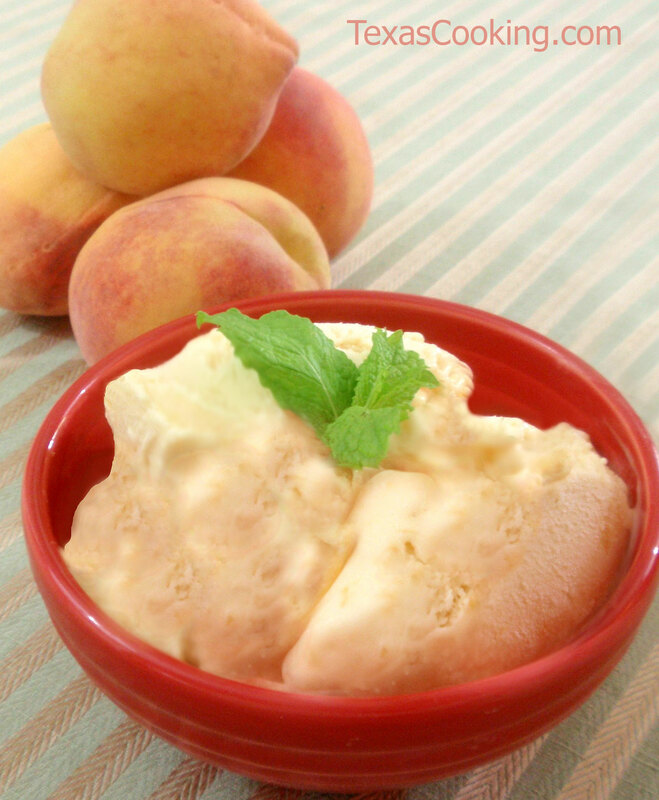 Can you think of any better use for fresh Texas peaches? In a blender, purée 3 cups of the peaches. Mash the remaining 3 cups of chopped peaches with a potato masher. Set aside. In a large bowl, whisk together the eggs, sugar, flour, vanilla and salt until well blended. Set aside. In a large, heavy saucepan over low heat, heat the milk and cream, just until it begins to steam. Pour a little of the heated mixture into the egg and sugar mixture, and stir. Then pour the bowl of egg/sugar/milk mixture back into the heavy saucepan. Continue to cook over low heat, stirring constantly, until mixture is thick and smooth. Remove from heat, and refrigerate the mixture for several hours or until well chilled. Add the puréed peaches to the chilled mixture, stir well, and pour into a 5-quart ice cream freezer can. Turn on the ice cream freezer or crank it by hand for 5 minutes. Then, carefully remove the top of the can and the dasher, and add the reserved 2 cups of mashed peaches, mixing them in with a long spoon. Put the dasher back in and the top back on, and continue freezing according to the manufacturer's directions. Allow ice cream to ripen for at least an hour.